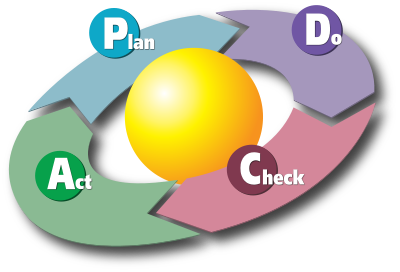 The Deming wheel is a method to help to learn and to lead the improvement of a product or process. This step, the most important, is to prepare a change or improvement. Someone has an idea to improve a product or process, we must prepare a trial or experience. The complete cycle is based on this first step. This step consists in making the comparison test or experience, preferably on a small scale, in accordance with the provisions set out in the first step. These study results. What have we learned? Do the results meet our expectations? If not, why? Three cases are possible. Either we decided to adopt the change, or to generalize the experience. Either we decided to abandon the study, so to continue working in same conditions. Either we decided to start the cycle by changing some initial conditions. When improving a process is performed, procedures and the company’s specifications obviously serve to consolidate.